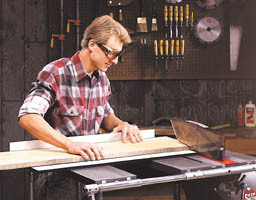 This ingenious sliding table acts like a "sled" to support long or wide workpieces as it carries them smoothly and precisely through otherwise difficult cross-cuts. With this accessory, precise crosscuts and miters on large pieces of stock are as easy (and as accurate) as with a radial arm saw! Its durable, laminated surface is a full 15-3/4-inches x 31-3/4-inches to provide plenty of support. The aluminum fence adjusts quickly for 90-degree, 45-degree, 36-degree, 30-degree and 22.5-degree angle cuts to make precise miters for four, five, six, or eight-sided projects. Available in three versions for use with all Mark 7 / Mark V models... as well as other table saws. A top quality UK sourced 250mm (10 inch) sawblade with imperial dimensions for the centre arbour of 1 ¼" This saw blade is 10 inch (250mm) outside diameter 48Tooth TCT (Tungsten Carbide Tip) Kerf on this blade is 3.2mm use this for trimming or crosscutting as it is considered as a fine cut blade. This blade runs clean and quiet, always a feature of a good quality blade.